Construction work comes with some necessary risks, but you can reduce the risk by outfitting your workers with high-visibility clothing from Nite Beams™. By making your staff more visible to passing vehicles and coworkers, the number of incidents your business encounters can be reduced, and productivity can stay on track. With Nite Beam™ lights, you’ll have the peace of mind you need through visibility. Law enforcement positions occasionally cause you to direct traffic or stand roadside for accidents, tickets, and more, and Nite Beams™ lighted clothing provides an additional safeguard against any potential hazards while on the job. 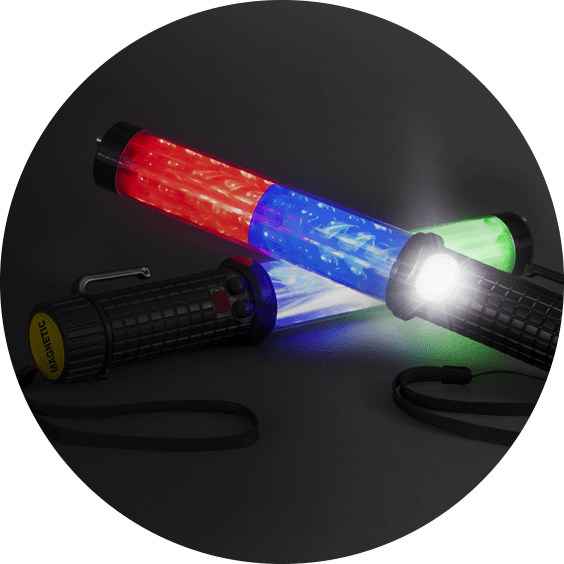 Whether it’s an attachable light or clothing with built-in lights, the law enforcement safety products from Nite Beams™ can help you and your workers get through nighttime shifts without worry. Roadside work, accidents, and more can put you and your workers at the mercy of passing drivers, and it’s during these times that Nite Beams™ can give you the protection you need. The bright LEDs in every Nite Beam™ traffic safety product illuminates you at night where only a reflective vest may not be enough visibility for drivers and coworkers. Workplace accidents are bound to happen, but you can reduce the amount with traffic safety products from Nite Beams™. Easy to operate and manage, Nite Beams™ provides instant visibility when you need it.